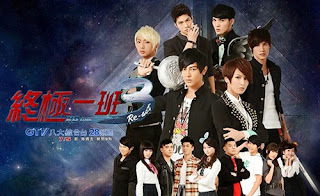 Cast: Jiro Wang, Pets Tseng, Lin Zo Hong, Xu Ming Jie, Sylvia Wang, Xiao Hou, Lou Hong Zheng, Huang Wei Jin and Chen De Xiu. This series is a spin-off of season 2, following the same characters, but is the “real” storyline. Compared to the last season this one is way better. They fixed a lot – like keeping Jiro till the very end – and of course and upgrade in story and acting. Two more members of SpeXial joins the group, one of them being Lou Hong Zheng whom I remember from K.O. 3an Guo – and adored. So, the quality of acting kind of evolved. What is amazing is that the group has grown on me, which I didn’t really think they would. This meant that every time I saw anything that reminded me of the last series, I laughed, rolled my eyes and enjoyed the ‘fan service’. Another thing that made me like this drama is the length – 20 episodes felt just right. Even though it had a lot of those typical fillers, the drama was okay to watch – even emotional sometimes. Pets is awesome as usual – officially my girl crush, and De Xiu is just perfect in this. Jiro looks younger (? ), I can’t really explain how and why I feel this, but even with the new idols around him he does not look older. Might be the acting, or his personality, but yeah, I wouldn’t give him more than 20-25 years. So: all in all, a funny and entertaining 3rd instalment of the drama – now to the next!